This is really a simplified version of the recipe for artichokes ‘a la polita’. Instead of pearl onions, I simply use chopped yellow onions. The artichokes are frozen and but in pieces, as they come out of the frozen bag at Trader Joe’s. How to make: In a big, deep pan, add all the ingredients above. Cover the veggies with water. Cover the pan and cook at low heat for about an hour. Correct salt, pepper, lemon if needed. Done. I have posted this post several more times. Here are slight variations and photos. 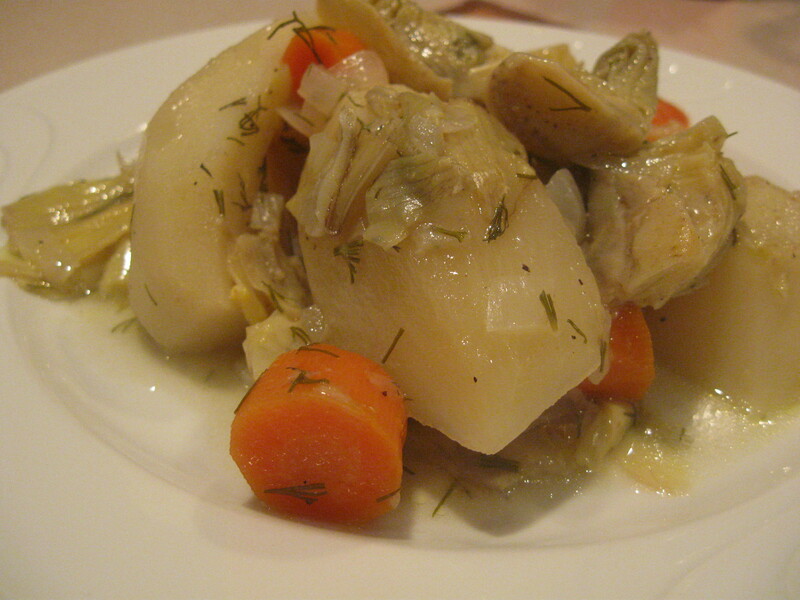 Artichokes with potatoes and carrots. Artichokes with peas, potatoes, and carrots.